The teen division of the 2016 Midwinter Art Contest had some incredibly creative entries this year. Each artist presented a very individual and insightful interpretation of the contest theme. I'd like to thank my fellow judges Rufus Dayglo (comics artist for Judge Dredd and Tank Girl) and Diana Paxson (author of Taking Up the Runes and Essential Ásatrú) for the time they spent considering entries and for their thoughtful comments on the works created by these talented young people. This contest would not be possible without their generous participation. Congratulations to our four winners! The assignment was to create a piece that somehow related to the character and legends of the goddess Freyja and the celebration of midwinter. This complex goddess has many aspects. The job of the artists was to find something about Freyja that spoke to them and inspired them, then combine it with some aspect of midwinter and create their own original work of art. The four winning artists created very unique and original works of art. I hope that they will all continue exploring Norse mythology and developing their artistic skills! 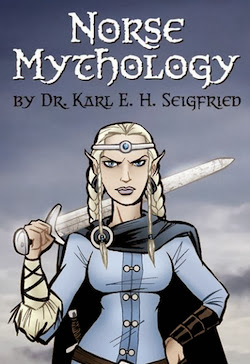 Freyja is depicted as taking on a number of disguises as she searches for her husband. As a result, you never know what she may look like, which is why I chose to leave her face out of the picture. I included her cats in the background, and made it after dark with snow blanketing the ground. One of the cats is playing in the snow, and the other is more curious about what she is doing. 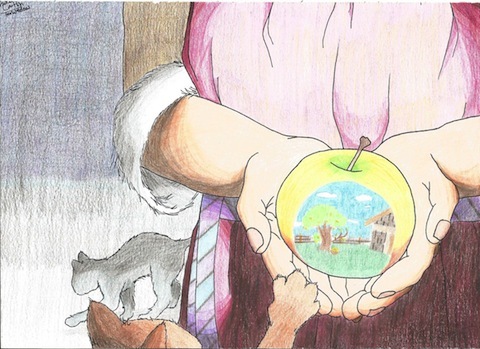 In Freyja's hand is a golden apple, showing what I hope looks like a summery scene of an apple tree near a small house. I chose to do this because Freyja shares an attribute with Idunn, fertility, and sometimes the two are depicted as the same goddess. Additionally, I have this little personal belief that in the winter, Idunn needs to work harder, in order to keep her tree from going into hibernation. Freyja, who is helpful to others across the mythology would probably offer her assistance here and there. The whole theme I was aiming for however, is that in the deepest times of winter, we can hold hope that spring will be here soon, heralding warmth, and the stories that might be told to each other in the dark when we are waiting. It's absolutely fantastic to see a young artist who both thinks deeply about her work and has the technical ability to manifest her creative vision. Congratulations for a deserved win! 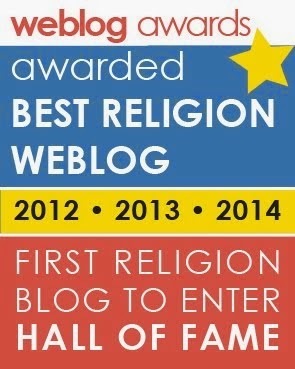 Rufus writes, "This is a very well-researched and beautifully drawn piece. I am so impressed by the level of workmanship and artistry. The hands are beautifully drawn. It is a very clever composition, and extremely well thought out! I hope you make many more paintings. Your art is fantastic!" Diana adds, "Drawing and use of color and shading excellent. The apple has a luminous glow. The concept is unusual and thought-provoking." I chose to focus on the feeling of Freyja and midwinter, because I experience the gods mostly as feelings. 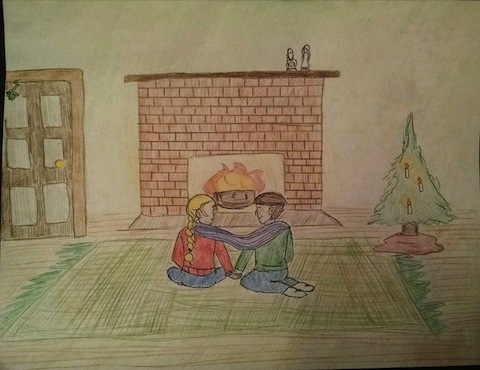 My image features me (with the brown hair) and my best friend sitting in front of a fire, watching a Yule log burn, and the log has the runes Fé (Freya's rune for wealth), Peorth for luck, and Ós for knowledge carved into it, to represent wishes for the new year as per tradition. I drew some mistletoe over the door frame, just because I know that was an old tradition as well. The tree is an obvious representation of ancient pagan tradition that many people see as a symbol of this time of year. It's kind of hard to see in the image, but the fire is casting a warm glow over the room, showing that Jól is a time dedicated to love and family. I also chose to make a lot of things shades of red and green for obvious reasons. There are statues of Thor and Freya on the mantelpiece. The scarf (purple and pink) draped around me and my friend is showing the generosity of love/Freyja, and what happiness can be caused if love is shared with one another. Freyja, to me, is very generous, loving, and self-sacrificing. My favorite story about her is when she lends her cloak to Loki for the greater good of saving Mjölnir, and when I read the quotes from Þrymskviða, it reminded me of how willing she was to help. Freya's influence on Jól in my interpretation is that strong sense of love that is always around while performing rituals such as the Yule log and just putting up a tree in your house with the ones you love. What a thoughtful approach to art! It's wonderful that Anna is able to evoke such powerful and deep associations with the goddess without actually literally portraying her (aside from the small statue). Diana says, "Excellent use of symbolism – a good portrait of Yuletide happiness." Rufus writes, "I really love this piece. It resonates with love and friendship, which is perfect for this time of year. All the clever details, like the scarf and statues, add up to make it a well thought out piece of art. It makes me happy to see people care about their friends!" 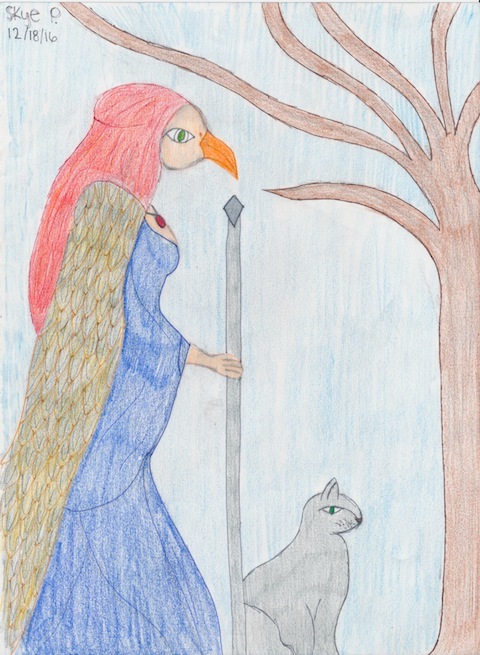 I drew Freyja standing in a blue dress with her feather cloak on. She’s part human while her face is a falcon, because I read that when her husband Óðr went missing, she used her feather cloak to change into a falcon to search for him. I also have one of her cats sitting next to her, because Freya has many cats as pets and they are normally represented as gray cats. She used them to pull her chariot, send messages, and assist in casting spells. I added Freyja’s necklace which is named Brísingamen. Very original! There's a deep thought-process behind the art, which gives real weight to the work. Rufus writes, "I like this piece as it shows Freya differently than the others chose to represent her. With the falcon cloak, it shows an adventurous and daring side to Freya, and I like all the research you have done. Well done!" Diana comments, "The structure of the design is very nice. I also liked the way you drew the falcon cloak. I have never seen her as a falcon-woman before, but the beak is effective." I drew the moment Freyja’s necklace was stolen by Loki, but instead of the setting being in her bedroom, I drew her outside, sitting in the snow, crying her tears of gold to relate to midwinter. She is crying because now that it is stolen, they will find out her secret. Her cats represent confusion as to why Loki stole the necklace. Deep down she knew it was stolen because Odin told Loki to take it for his own use. Lindsey has a very creative interpretation based on thinking deeply about Norse mythology. This engagement with the lore has led to a unique approach to the subject. Great work! Diana writes, "I really like the expressions on the faces of Freyja and the cats. Putting the theft of the necklace in winter is a nice bit of symbolism." Rufus comments, "This is a fantastic drawing! I love how you can see Loki fleeing with the necklace off the page. It is a well-drawn study of Freya and a brave composition. You've used a very dramatic pose and chosen the scene carefully. You are very talented!" Adult winners will be announced tomorrow!